2012 limited repress. 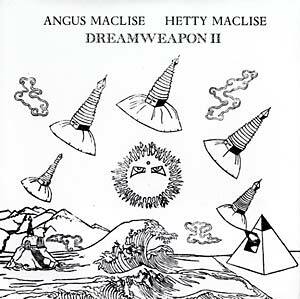 "Boo-Hooray is pleased to announce the release of a new LP of Angus MacLise recordings: Dreamweapon II. Previously available an extremely limited run as a giveaway CD-R available exclusively at the opening of the Dreamweapon exhibit in May, this new LP release features previously-unreleased material from the Angus MacLise audio archive. This LP release features extended and remastered versions of four of the tracks from the giveaway CD-R. The LP comes in a screen-printed sleeve and includes a risograph-printed insert featuring a miniature facsimile of year, a broadside poster by Angus MacLise originally issued in 1965."